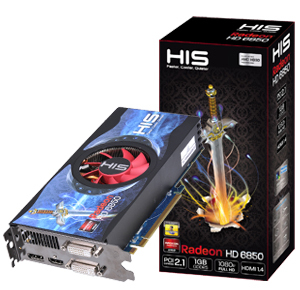 Today Hightech Information System (HIS) announced it new baby the HIS RadeonTMHD 6850 & 6870 graphics cards. Loaded with HD3D stereoscopic technology and three main pillars- Eyefinity, EyeDefinition and EyeSpeed, the new HIS Radeon HD 6850 & 6870 bring an incredible experience of application performance and flawless high-resolution imagery for fully immersive gameplay. Whether it’s enthusiastic gamers hungry for the latest and coolest technology to win virtually at every game, or PC users who want a fast system for their multi-tasking, the new HIS RadeonTM HD 6850 & 6870 are without a doubt the best solution around. The HIS RadeonTM HD 6850 & 6870 not only offer incredible HD gaming performance on all the latest game and DirectX 11 support, but also makes multi-tasking easier with features like Eyefinity technology. So get ready as we bring our all-in-one technology - HD3D, Eyefinity, EyeDefinition and EyeSpeed- right into your home. Play the latest DirectX 11-capable games in true “EyeDefinition” with the AMD Radeon™ HD 6800 Series graphics. AMD’s second-generation DirectX 11-capable architecture enables ultra-realistic effects and lightning fast frame rates for the ultimate HD gaming experience.